Group launches 2018 medical cannabis ballot. Utah Patients Coalition campaign director DJ Schanz speaks at the podium during a press conference at the Capitol on Monday. On Pioneer Day 2008, Erin Madsen, an LDS mother of five, revived her husband, Sen. Mark Madsen, from an opioid overdose. Suffering from chronic pain, Mark Madsen was prescribed pain medication that both alleviated his ailments and imperiled his life. “It was terrifying,” she told City Weekly. In a state that ranks in the top 10 in opioid overdoses, Utahns like Madsen see cannabis as a pain relief option that doesn’t put patients at risk of fatal overdoses. 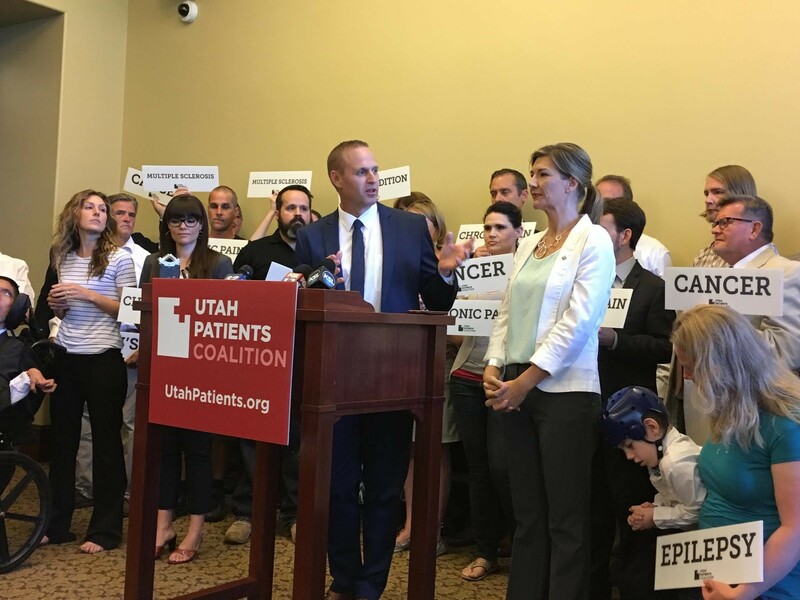 On Monday, Erin Madsen stood with more than 30 others at the State Capitol to support the Utah Patients Coalition, which intends to push a ballot initiative to legalize medical cannabis by January 2021. State lawmakers have been grappling with medical marijuana bills for several years now (Sen. Madsen sponsored SB-259 during the 2015 Legislative session, followed by SB-73 in 2016), but have failed to pass any legislation. 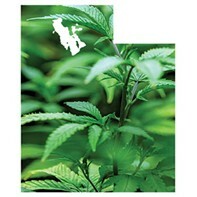 So the Utah Patients Coalition is embarking on a campaign that will let the voters decide. Citing polls, the coalition notes that the state supports medical marijuana by an almost 3 to 1 ratio. 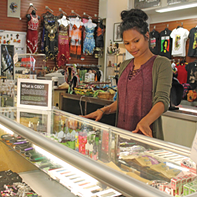 Madsen has also noticed her community embrace the idea of medical cannabis. Supporters at Monday’s press conference held up signs that read ‘chronic pain,’ ‘cancer,’ ‘epilepsy,’ ‘PTSD.’ At the podium, several speakers offered emotional testimony about the suffering their loved ones endured. Candi Huff told the story of her daughter, Madison, who was diagnosed with epilepsy. In 2009, she had a compulsive seizure, and then another, and then another. Medication failed to bring relief. Around 2014, Madison began using cannabis oil. Desiree Hennessy shared the story of her adopted son, Hestevan, whose cerebral palsy is accompanied with nerve pain and seizure disorders. 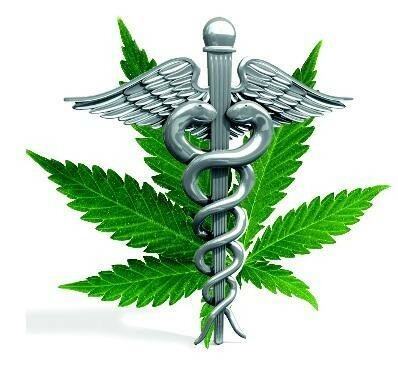 It would not allow patients to smoke marijuana, for example. Home-grows would continue to be banned. Driving while under the influence laws wouldn’t change. And no one would be allowed to use marijuana in public view. 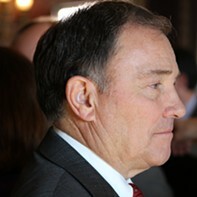 “That’s important because we live in a conservative state, and many in the public have legitimate concerns. We’ve addressed and resolved those concerns in this bill,” said Connor Boyack, who worked as a consultant on the initiative. Local governments would have autonomy to zone cannabis facilities, law enforcement and regulators would be given broad power to inspect and oversee the program, and the bill limits the number of dispensaries to one per 100,000 people in a county. Felons would be barred from working in cannabis facilities, as well. The intent is to get the initiative on the ballot in 2018. If passed, patients would be able to apply for medical marijuana cards in 2020, and it would go into full effect in 2021. The initiative includes a provision that requires regulators to enact the law. If the government doesn’t comply or drags its feet, the initiative includes language that would allow patients to legally grow small quantities of marijuana for medicinal purposes outside residential areas. “That is a clause that is hopefully never triggered, but if the government is not willing to respect the voice of the people, patients can still get the help they need,” Boyack said. Campaign Director DJ Schanz expects the lieutenant governor’s office to respond within about a month whether language in the initiative needs to be tweaked and to outline the expected fiscal impact. Schanz also estimates the campaign will cost around $3 million. So far, the coalition has raised almost a third of it, he said. Erin Madsen notes that by design, the initiative should not impact folks who don’t need treatment.